Connor, Risa, and Lev are all being sent to be unwound. They get away, much to the latter’s disappointment. Connor and Risa are taken in by a nice old lady, who gets them sent to a warehouse, after which they get sent to the Graveyard. There’s an antagonist called Roland, who isn’t very nice at all. Roland causes trouble, and a bunch of people go after the Admiral. Roland gets Connor, Risa, and himself sent to a harvest camp, where Roland is unwound. Luckily for Connor and Risa, Lev turns up at the harvest camp, ready to blow the place up as a clapper. He changes his mind when he sees Connor and Risa, ultimately saving Connor’s life. Connor and Risa go back to the Graveyard to run it, since the Admiral is now retired after suffering from a heart attack. Lev is put in a cell until the explosives levae his system enough for him to be deemed safe. In this world, teenagers can be given away by their parents and unwound – their body parts will be given to those in need. This is because abortion has been made illegal. Connor, one of the three main protagonists, discovers his parents are going to have him unwound because he’s been behaving badly. Before he can be taken, he runs away and hides in a truck. The truck driver allows it. Shortly after, the truck driver is arrested on the highway and Connor’s parents find him. Connor runs across the highway. Risa, the second protagonist, is an orphan, so she is also a ward of the state. She’s also about to be unwound. Risa is on a bus when it crashes on the highway. Lev, protagonist #3, is the tenth child in his religious family. Because his family believe in giving back to their god, Lev is being sent to be unwound. This is called tithing. Lev is on his way to a harvest camp when his car is stopped on the highway, and Connor grabs him to use him as a hostage. Pastor Dan tells Lev to run away. Lev, Connor, and Risa run into the woods. Connor brings down a policeman called Officer Nelson. Lev resents Risa and Connor for saving his life. He wanted to be unwound. Risa and Connor argue to see if Lev will run off while they’re distracted. He doesn’t. A teenage girl storks a baby and Connor picks it up. Now he has to keep it because the intended family caught him. Risa, Connor, and Lev (and the baby) go into a school and pose as students. Connor reveals that his family was storked one time, but they passed the baby on to a neighbour in secret. Two weeks later, the baby arrived back on their doorstep, sick and dying after having been passed from house to house for so long. No one wanted it. Connor’s parents took it to hospital but it died. From the school, Lev calls Pastor Dan. Pastor Dan tells Lev that he’s convinced his family to not call the police, because Pastor Dan wants Lev to live. It’s a bit late though, because Lev has already alerted the police and they’re on their way. Hannah, a teacher, helps Risa and Connor get away by pulling a fire alarm. Risa tells Connor to start clapping, and the rest of the students think that there are clappers in the building. Chaos erupts, and Risa and Connor manage to get out unseen. Hannah tells them to find Sonia, and they leave Lev behind. Sonia, an older woman who owns a shop, puts Risa, Connor, and the baby in a secret cellar with a few other teens called Hayden, Mai, and Roland. The latter has a tiget tattoo on his arm. He is rather controlling and aggressive, and he and Connor don’t get along. Hayden tells the story of Humphrey Dunfee, who was an unwind. He gets unwound, and his parents realise they made a terrible mistake. They look up their son’s records, and go off to find all the people who have parts of their son so they can kill them and put their son back together. Sonia asks Risa and Connor to write a letter to someone they love. They have to fill it with everything they wished they could have said, but never had the chance. Sonia says she’ll keep the letters until their 18th birthdays, when they’ll have to come back to get them. If they don’t survive, Sonia will send the letters herself. She puts the letters in a chest with hundreds of others. Lev meets a guy called CyFi, who also claims to be a runaway. He reveals that he was in an accident and he had to have his brain tissue replaced. CyFi is on his way to a place called Joplin. He occasionally switches voices and talks about his mum, who doesn’t exist because CyFi was raised by two dads. He also steals things and then swears it wasn’t him. He seems very unstable. He tells Lev that he received another boy’s right temporal lobe and that this boy sometimes takes over. Risa and Connor are taken to an empty warehouse where a bunch of other unwinds are being kept. Roland and co. go with them. Roland immediately wants to become top dog, and he tries to provoke Connor. Roland follows Risa into a bathroom in an attempt to get Connor to make the first move. Connor tells Roland that he and Risa are broken up and so he’s not bothered what Roland does with her. This gets Roland to leave Risa alone. The teens at the warehouse are crammed into crates and flown to Arizona, where there is an aeroplane graveyard which is run by the Admiral, a man in his 60’s.. Connor meets a boy called Emby, who has an unwind’s lung. Lev and CyFi reach Joplin. CyFi leads Lev to the other boy’s (the one whose temporal lobe has been given to CyFi) house. His name was Tyler. CyFi now calls himself Cy-Ty. Cy-Ty digs up a bunch of stolen goods from the back garden. Cyrus’ dads show up and Lev runs. Everyone has to pull their weight at the Graveyard. Risa starts as a medic, Connor becomes a mechanic, and Roland becomes an unofficial pilot with a guy called Cleaver. Connor begins to question the Admiral’s intent. Lev arrives at the Graveyard. Connor hits him and and then tells him he’s glad that he’s alive. Connor speaks with the Admiral. Connor accuses him of being a monster because he has dentures, something people generally don’t have any more due to unwinding. The Admiral admits he does “sell” unwinds into service positions, but the money goes to helping other unwinds at the Graveyard, and the “sold” unwinds are always volunteers. The Admiral shows Connor a bunch of dead bodies that he found in a sealed crate. Someone killed the most powerful teenagers and the Admiral wants Connor to find out who did it. The Admiral tells that back before the Bill of Life was passed, people were murdering abortion doctors and things. There was a war. A scientist figures out how to reuse every part of the body. The Bill of Life was signed. People started demanding more parts, and unwinding became a huge business. The Admiral had his own son, Harlan, unwound because he behaved badly and the Admiral had to set an example, since he was one of the big names in the country. He changed his mind after it was too late. He started the Graveyard to help unwinds because of Harlan. Lev, Mai, and Cleaver (and a bunch of other unimportant people) are going up against the Admiral. Turns out that the Admiral is Admiral Dunfee, the father from the Humphrey Dunfee story. Emby is sent to see the Admiral’s ex-wife, Harlan’s mother. Connor talks to Roland about the dead teens, while a search party is sent out to look for Emby. The search party finds those five bodies and goes after the Admiral. Risa is in the Admiral’s jet with him, and the heat starts rising as the crowd rocks the jet. Connor stops the mob, and tells them that Cleaver killed the five teenagers. The Admiral has a heart attack. Connor, Risa, and Roland take the Admiral to hospital. Juvey-cops come to question them, and Roland turns Connor and Risa in. He also tells the cops about the Graveyard. This didn’t do Roland any favours, because they send all three of the teenagers to a harvest camp. At the harvest camp, Risa joins a band which plays when teenagers go into the building to be unwound. The band members are kept alive a bit longer than the rest. Lev arrives at the camp disguised as a tithe, like he should have been before Connor interrupted his plans. Lev, Mai, and Blaine are all clappers. Roland is unwound in the creepiest scene I have ever read. He’s kept awake during the procedure. NOPE. Connor is about to be unwound. Risa is playing on top of the building. Lev and the other clappers plan to blow the place up. None of them want to go first, so they all wait for each other. Lev sees Connor and Risa, and stops what he’s doing. Blaine accidentally sets off the detonator and Mai follows suit. Lev runs to get Connor, who was in the building when it was blown up. Connor wakes up from a medically induced coma two weeks later. The doctors have given him Roland’s arm, the one with the shark tattoo. They don’t know who he is, and they have assumed he is a security guard from the harvest camp. Risa is paralysed from the waist down, but she refuses to take an unwind’s spine, so she’ll be confined to a wheelchair from now on. Meanwhile, Lev has been put in a cell where he can’t blow himself – or anyone else – up. Pastor Dan comes to see him, and and he tells him there’s talk of lowering the age of adulthood from 18 to 17, which would save some people from unwinding. There have also been protests against unwinding in Washington. Pastor Dan shows Lev a magazine. Lev is on the cover, and he’s now known as the clapper who didn’t clap. “Now you’ve put a face on unwinding.” Lev won’t be unwound for his crimes because the explosive will never be fully out of his system. His older brother, Marcus, is appealing for custody of him. At the Dunfee residence in Texas, everyone who has bits of Harlan is gathered. The Admiral has moved back in with his ex-wife, who is now looking after him after his heart attack. They’ve finally succeeded at bringing Harlan back together. Connor is running the Graveyard now. He tells the teenagers that they’re going to make a difference to the world. Unwound – To have 99.4% of your body dismantled and given to people who are in need of it, so you’re technically still alive, according to the authorities. You can only be unwound from the ages of 13 to 18. 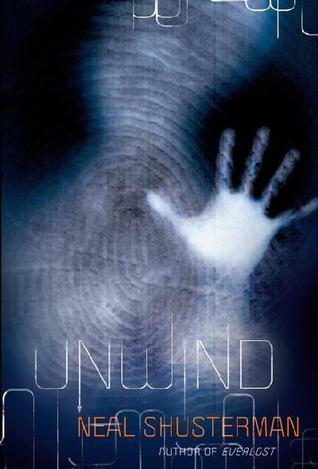 Unwind – Someone who is going to be unwound. Tithe – Someone who is willingly going to be unwound, usually due to religious beliefs. Bill of Life – The bill that passed many years ago that made abortion illegal, and legalised unwinding. Storking – The act of leaving a baby on someone’s doorstep. If you find a baby on your doorstep, then it is legally now yours. Unless you catch the parent in the act, in which case they must keep their baby. Harvest camp – Where teenagers are unwound. Clappers – People who have explosives in their blood. They clap to set off the detonators. Ward – A ward of the state. Akron AWOL – What people are calling the legend that is Connor. The Graveyard – The place where some unwinds are sent, where they can live in secret up to the age of 18. Run by the Admiral until his retirement.